Rahul Gandhi has been spearheading the Congress attack against the government on the Rafale jet deal. The Congress alleges irregularities in the deal for buying 36 Rafale fighter jets off-shelf from France, which was finalised in September 2016 during PM Modi's visit to France. Rahul Gandhi today asked why PM Narendra Modi is silent on the Rafale deal. New Delhi: The government's stand that the details of 58,000-crore Rafale fighter jet deal cannot be disclosed to the public has brought a sharp rejoinder from the Congress. 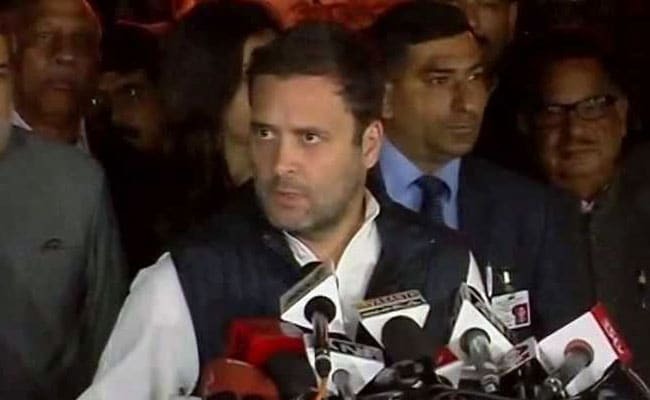 Party chief Rahul Gandhi, who has already accused the government of conducting a scam, today said the government was using a confidentiality clause to conduct a cover-up. "For the first time, the defence minister is saying that we will not share details of money spent on buying the aircraft...I spoke during the Gujarat polls that there is a scam (in the Rafale deal). Modi ji has personally got the deal done," Mr Gandhi told reporters outside the Parliament, according to news agency PTI. "Modi ji had personally gone to Paris. Personally the deal was changed. The entire India knows it," the PTI report quoted Mr Gandhi as saying. Mr Gandhi also mocked the government with a tweet under the hashtag #TheGreatRafaleMystery. RM says the price negotiated for each RAFALE jet by the PM and his "reliable" buddy is a state secret. Rahul Gandhi spearheaded the Congress attack against the government on the fighter jet deal since aircraft manufacturer Dassault Aviation went for a joint venture with Reliance Defence Limited in 2016 under Prime Minister Narendra Modi's Make In India scheme. Today, he questioned why PM Modi is silent on the issue. "Why does Modi never say anything on Rafale deal? What is the price that the Prime Minister has spent on Rafale?" The fresh Congress assault comes as Defence Minister Nirmala Sitharaman, who promised earlier to share the financial details of the deal, told parliament yesterday that it cannot be done. The information, she told parliament, is "classified". In an earlier tweet, Rahul Gandhi had earlier said Ms Sitharaman's "boss" was "silencing her". NDTV has earlier reported that a confidentiality clause in the government-to-government deal meant neither India nor France can release these details unless ordered to do so by a court in the event of a disagreement between both parties. Similar clauses existed in all the deals signed by the UPA government. The Congress alleges irregularities in the deal for buying 36 Rafale fighter jets off-shelf from France, which was finalised in September 2016 during PM Modi's visit to France. The party says under the deal, India will pay three times more than what it would have paid under a deal negotiated by the UPA government in 2012. The government has rubbished the Congress stand, arguing that the UPA had been unable to close the cheaper deal. It also said the new agreement includes a superior weapons package and logistical support, which had been absent in the previous one.